54% of research as conducted by UK universities or colleges are termed as "world's leading" or "internationally acclaimed" and "Globally excellent". UK universities indeed enjoy strong global reputation and have been a Mecca for aspiring students all around the world from centuries. The 2013/14 QS World University rankings found that employers worldwide consider UK Graduates among the most "employable" from a global survey of 27,000 graduate employers. I am a MBA in marketing and Finance. My interest however, were always lied with Psychology and Behavior. I was always intrigued by the two facades of Psychology- Child Psychology and Criminal Psychology. Both totally different than each. Even after doing my MBA, my heart still fondled that dream that I saw years back- I wanted to study psychology and practice the same. After lot of weighing up and down, I decided to pursue a PhD-Doctorate and preferably in field related to psychology. To give wings to my dreams, I started doing my research, preparing for GRE/GMAT, searching for universities that could take me. I was quite deep seeded in it that my office colleagues and seniors started calling me- Dr Ekta Khetan. I was amused, I was fuelled with a new ambition and happy to get an almost green flag from my family who insisted that I should gain some experience working before I take to further education. I wanted to do my doctorate with nothing but best college/university in the world. From Erasmus Mundus to many other education program tried to lure me but my heart somehow was set on top universities of two countries- USA and UK. Did I tell you how fascinated I was with word "Oxford" since my childhood and harnessed dream of being an "Oxonian" sometime? Well Oxford has always been a favorite in my list. Given an opportunity to fulfill my dreams of further study, and studying in UK, I will chose to study one of my most favorite subject of all time- Psychology! I would go for Masters and above degree for the same in field of Cognitive, Developmental, Social and Clinical Psychology. Needless to say why I have chosen this subject. Here's why- I have been fascinated by various facades and potential power of human's mind and psyche [displayed and latent]. Since my early childhood I have the opportunity to live across the country and I have observed people too closely. It is our brain and power that makes us do certain things and not do certain things. To understand it even better and mold it for further betterment of science, environment and life, makes the subject even more interesting for me. Intriguing is the word, I call it interesting and awe inspiring. I have sometime back done an online research regarding well known colleges and Universities in UK that specializes in various courses of Psychology. From the top Universities of Cambridge, Oxford, Bath, Glasgow, Durham amid others, I have chosen "University of Sheffield" as my top priority, followed by few other sin the list. Being a Psychology enthusiast, I understand that our span of interest is low and we see the top recalls, so I will write about my top priority to keep yours [my readers] mind clear of clutter and convey my thought. If I could Study in UK- Why University Of Sheffield! University of Sheffield's course, of all UK' psychology degrees, boasts the highest rate of students who find employment within 6 months of completion of their course. Well "placements" is a key factor but not the only factor that determined my selection. "Students Satisfaction" is equally important and if Telegraph's University' studies and research has to be believed- University of Sheffield also enjoy 80% of it's graduating students to be highly satisfied with their course. Popular Courses- Apart from Psychology, medical is the most popular course in university along with engineering, law and management. It dons multiple hats making the University open and adaptable to knowledge across domains and industry. World Leading Research- The University has been consistently rated as one of the top performing psychology departments in the UK for research. And what is use of studying a complex science and art like psychology that is ever changing, ever surprising stream without proper research focus? According to recent ESRC International benchmarking exercise, the department is currently the 5th highest in terms of QR and 7th in terms of research funding in UK Research partners and clients includes- Boeing, Unilever, Rolls Royce, GSK and overseas Government agencies and charitable organizations. Student Amenities- The university campus is located one and half miles west of Sheffield's city center and it has facilities like- student accommodation, local bus transport facility among others. If you want to do psychology in Music then you have options of many hotshots bands frequenting the area and as the biggest city in South Yorkshire, there's a vast number of bars, pubs and clubs in the area. Barely leaving any room for dull moment there. Psychology offered as single subject- Cambridge is the top rated university in UK but unfortunately it doesn't offer psychology as single subject but requires students to acquire it via PPS route or embarking on a natural sciences degree. Top places to study- In recent survey and research, Sheffield is among top 5 universities for the subject. Nobel Prize- The university of Sheffield has produced five noble prize winners. Need I say more? So what are you waiting for. 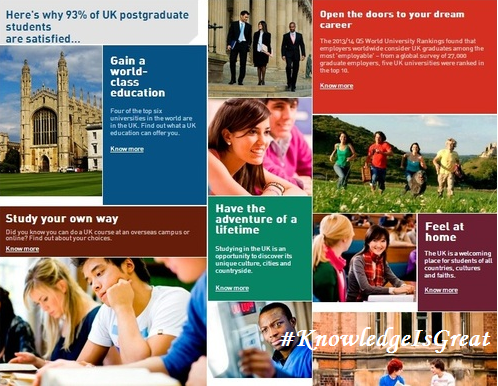 [To know more and experience the best in Sheffield, click here] If you harness a dream of studying abroad and study in world class institutions, then take up your pen and gave a holla to #KnowledgeIsGreat and chase your dreams! The world is waiting for you. Where are you? Very informative post ma'am. I loved how you have approached it - stating different pros. Thanks Bhavya! I am glad that you liked it and appreciated as well. Keep blogging..keep reading numerounity. Sheffield gives the world the best in steel cutlery... and they have two universities there. Nice post... all the best. wow, interesting! Thanks for sharing! Nicely structured post, (Dr) Ekta! A well written post, Ekta. All the best for the contest! That was quite an informative post Ekta.. All the best for your dreams as well as the contest..
Well written and nice Ekta. Best wishes. Thats great. I wish if I had known earlier, would have taken her/his help to add pictures..Never mind, wish her all the best. Good post. But I am prejudiced with American universities. London/England is a good place to visit only. Not to live there.